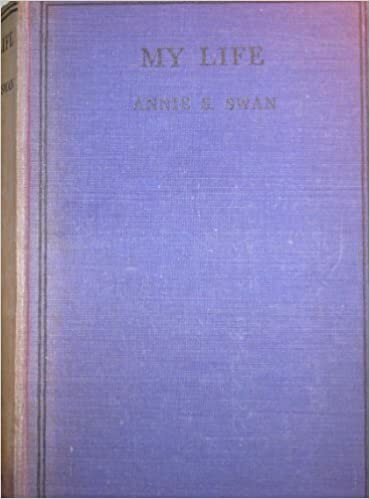 Have any of you ever read any books by the Scottish author Annie S. Swan? Between 1878 and her death in 1943 she wrote over 200 novels, short stories and serials. She has been called “one of the most commercially successful popular novelists of the later nineteenth and early twentieth centuries” but only a few of her books have been recently reprinted. She began her career writing serials for the wildly popular Peoples’ Friend which is still going although they can’t be selling nearly as many copies as in earlier times as it used to be sent all over the British Empire. She also wrote under her married name Annie Burnett-Smith and as David Lyall she wrote serious newspaper articles about politics, including the Boer War. I’ve read a few of her books and quite enjoyed them, but she’s a bit of a local hero among some people here in Fife as for a couple of years she lived in the teeny village of Star of Markinch when her husband was a schoolteacher there. In this book she says very little about her time there but to be fair it must have seemed like the back of beyond for her as even now it’s a bit of a backwater. Apparently she wasn’t all that keen on writing her autobiography as inevitably ‘the Ego, which I don’t very much like abounds’. But she had an eventful life, considering that she was born into a farming family near Edinburgh, but her father wasn’t a very good businessman and failed even at growing potatoes. With really no encouragement from her family Annie got stuck into writing short stories and when she got married it wasn’t only a couple of years until her husband was able to give up his teaching job and study medicine, something he had always wanted to do but it hadn’t been affordable. Annie discovered that she was good at public speaking, addressing hordes of women, often they were keen to get a sneak preview of her ongoing serial. This talent for speaking led her to be asked to go to America during World War 1 to tell them how urgently the UK needed food that only they could supply as we only had six weeks’ worth of provisions left. After a difficult start she ended up being invited all over the place and meeting ‘high heid yins’ such as Herbert Hoover. She also met Howard Heinz and I imagine his beans were deployed against the Kaiser. She felt most at home in Boston of course, but “wished that American history books could be more accurate in their accounts of certain events in which the British were also involved.” Hmm yes I know what she means! The war woke her up to politics and she stood for the Liberals in the 1922 General Election, but came in last. This didn’t put her off though and she later became a founder member of the Scottish National Party. I wish they had been more careful when choosing a name for it and hadn’t stuck in that word ‘national’. When she was speaking to one poverty stricken woman she was told “Ah, weel, I dinna understand it a’. We’ll vote for onybody that will mak’ us better.” – and that’s the problem with democracy. People believe all the promises that rarely come to fruition. Nigel Farage said as soon as the poll booths were closed that he regretted things said in his campaign, but they get away with it. She has quite a bit to say about marriage and specifically her own as she and her husband often held very different views on things and as they both had tempers things were often fraught I think but she thought that that was much better than being a part of one of those couples who agree on everything. I agree with that, in my experience that just means that one person is always suppressing their feelings and being a doormat. Despite having a full and successful career her happy family life ended when her 15 year old son died in a shooting accident while packing to go back to Rugby School at the end of school holidays. I always have my doubts about those teenage ‘accidents’. It’s obviously something that she and her husband and their daughter never quite got over. When her husband Dr Burnett-Smith was working up his business (pre NHS obviously) they moved down to England and ended up in London where they moved in literary circles, in this book she does drop a lot of names, but she had lots of friends among other writers such as J.M. Barrie and Thomas Hardy. Scotland always pulled them home though and they built a large house in Kinghorn on the east coast not far from me in Fife. Annie, her husband and their son are apparently buried there so I plan to go there soon to see their graves and track down the house they built – The Anchorage. I found this to be an interesting read but I’m not sure how easily obtainable it is, my friend Maureen kindly loaned me her copy. This entry was posted in Books, Scottish literature and tagged Annie S Swan, My Life, Scottish author by Katrina. Bookmark the permalink. It’s twenty years since I read them, but I’m pretty sure I still have “Elizabeth Glen, M.B.”, and “The Stepmother”, by Annie S. Swan. It’s possible I may still have her autobiography too. They’re the kind of book I used to seize on sight at charity book-fairs, not very many books of that type around now though. I don’t often come across them here in secondhand book shops and when I do they tend to be expensive. I’ve managed to borrow a few though. Maureen has just given me The Gates of Eden and she thought it was very good. Have never read any of her books but I remember them being mentioned in an O Douglas novel as “capital for a confinement”. You have a very good memory as I’ve read all of the O.Douglas books and that had gone past me, but I can just imagine her writing that. Thanks for dropping by and taking the time to comment. Ah! tracked the phrase down to “Ann and Her Mother”, chapter X. Thanks. You missed your calling – you should have been a sleuth! It always surprises me when I hear of such a prolific author for the first time. She sounds an interesting lady. Me too. I suppose that by now it is quite a few generations since her heyday. I was quite surprised by her writing as I had expected it to be lighter and frothier, but I think there usually is a romance involved.